X-ray of the knee joint. X-rays are a form of high frequency, high energy electromagnetic radiation which, since their discovery in 1895, have been used increasingly in medicine both for diagnosis and treatment. X-rays can be used to produce images of bones, organs, and internal tissues. Low doses of X-rays are passed through the tissues and cast images – essentially shadows – on to film or onto a fluorescent screen. The X-ray image, also known as a radiograph, shows any structurally changes in the area that is being examined. X-rays have the potential to damage living cells, especially those that are dividing rapidly. Because cancer cells divide rapidly, high doses of X-rays are used (along with other forms of radiant energy) for treating cancer. X-rays are produced artificially by bombarding a tungsten target with electrons in a device called an X-ray tube. The X-rays that are emitted travel in straight lines and radiate outward in all directions from a point on the target. In an X-ray machine, the X-ray tube is surrounded by lead casing, except for a small aperture through which the X-ray beam emerges. Each of the body's tissues absorbs X-rays in a predictable way. Bones, which are dense and contain calcium, absorb X-rays well. In contrast, soft tissues – skin, fat (see adipose tissue, blood, and muscle, for example – absorb X-rays to a lesser extent. Thus when an arm, for instance, is placed in the path of an X-ray beam, the X-rays pass readily through the soft tissues but penetrate the bones much less easily. As a result, the arm casts a shadow on to film or on to a fluorescent screen, with the bone appearing white and the tissues dark gray. When a patient arrives for an X-ray examination, the radiographer explains the procedure. The patient undresses to expose the area to be X-rayed and must remove any objects that might produce an image on the film, such as jewelry, hair-grips, dentures, or a wig. The position of the patient when the X-ray is taken is carefully chosen to provide the clearest view of the part under examination, although this position may require modification if the patient is very ill or in severe pain. The X-ray film is usually contained in a flat cassette; the patient lies, sits, or stands with the region to be examined in contact with the cassette. To avoid getting a blurred image, the patient must keep still while the X-ray is taken. Every effort is made to keep the patient comfortable and relaxed and to use the shortest possible exposure time – usually just a fraction of a second. If necessary, the region under examination can be supported or immobilized. When the patient is in the correct position, the film is in place, and the X-ray tune is ready, the radiographer leaves the room for a few moments and pressures the exposure button on the control panel to take the X-ray. Once the X-ray film has been developed, it is interpreted by a radiologist. Some disorders, such as fractures and dislocations, are immediately recognizable; others, such as tumors, may take more time to assess. 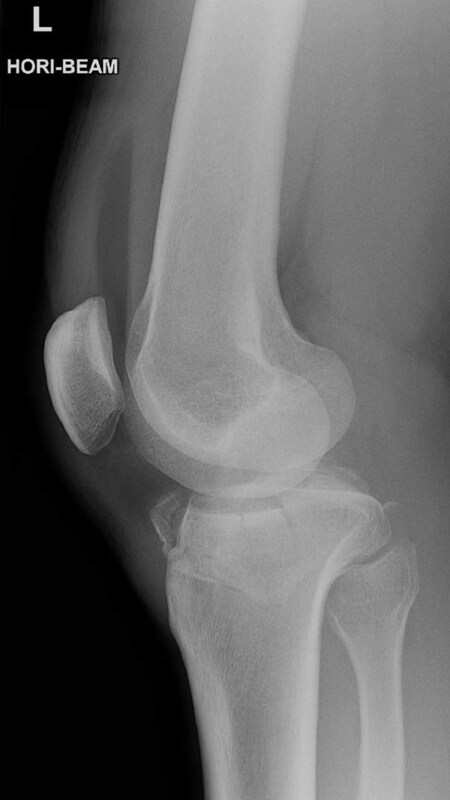 Hollow or fluid-filled parts of the body often do not show up well on X-ray film unless they first have a contrast medium (a substance that is opaque to X-rays) introduced into them. Contrast-medium X-ray techniques are used to look at the gallbladder (cholecystography), the bile ducts (cholangiography), the urinary tract (urography), the gastrointestinal tract, the blood vessels (angiography and venography), the spinal cord (myelography), and the spaces within joints (arthography). X-rays can be used to obtain an image of "slice" through an organ or part of the body by a technique known as tomography. More detailed and accurate images of a body slice are produced by combining tomography with the capabilities of a computer to give computed tomography scanning (CT or CAT scanning). Large doses of radiation can be extremely harmful and even small doses carry some risk. Modern X-ray film, equipment, and techniques are designed specifically to produce high-quality images with the lowest possible radiation exposure to the patient. The possible hazard of genetic damage can be minimized by using a lead shield to protect the patient's reproductive organs from the X-rays. X-ray examinations are generally avoided if there is any possibility of pregnancy. Radiographers and radiologists wear a film badge to monitor their exposure to radiation.